Gull Sketch – Let's Paint Nature! 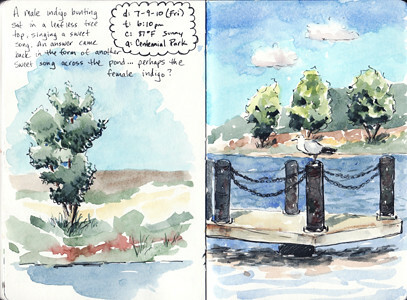 Last week I made a visit to a local retention pond, turned park and made a quick sketch. Centennial Park has a paved walking trail and a pier. 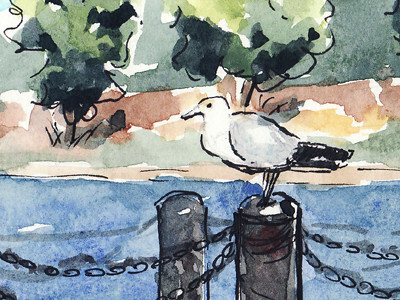 The pier had several gulls and even though they are not my favorite birds (I call them parking lot rats or flying rats), I painted them anyway. I started on the right side of the sketchbook and made a pencil sketch before painting. On the left side I decided to paint without a pencil sketch. Sometimes that can be scary because you don’t know how things should look before you start, but that can also be a good thing because sketches tend to be more loose when not penciled down. I hear you on seagulls not being your favorite. I was in that boat at one point, but have found some way to appreciate them. Their lazy gliding is kind of pretty. Beautiful sketch. I used to not like gulls but since I decided to study them, I really like them. They are beautiful and a real challenge to identify. I’m not around gulls too much so they don’t bother me and I love to watch them fly. I like your sketch–you captured his stance quite well. Lana: Nice lazy gliding feature you mention, I can picture it in my head and also kind of like that 🙂 Thanks! Northern Birder: Oh I can imagin it be challanging to identify! There are so many that look the same! You have a good point.